"I do not remember when I was born. But when I was three years old, my mother returned to my grandparents' home, with me as proof of her failure." Have you ever gone to see a film, fully expecting it to be a good one, and while watching it you realize the film is—for lack of a better word—transcendent? This happens to me very rarely. I usually know what to expect in a film, and I've also seen my share of hype. So when I originally saw the theatrical trailer for Before Night Falls, with its accompanying list of awards, I was curious yet skeptical. The film looked gorgeous, and I love Johnny Depp, so I eventually went to see it. By the time I left, I considered Before Night Falls to be the third best film of 2000 (just behind Requiem For A Dream and Dancer In The Dark). Skip ahead a few months, and Before Night Falls arrives in the mail. I relish the opportunity to watch it again as I place it in my DVD player. I select "Play Movie," but then I pause: Would it be worth it? Could my second viewing possibly live up to my first experience of seeing the film? Would I have the same emotional reactions? Or would I notice a mistake in a shot and have a great scene forever ruined? The answer? Yes. Yes it can. It can and does live up to every memory I had from my first time. 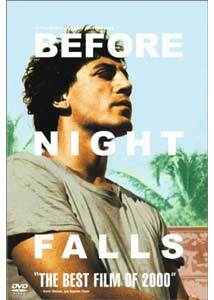 Before Night Falls is the true story of Reinaldo Arenas, a gay Cuban writer. Castro's government persecutes Arenas for his "subversive" books and his open homosexuality. The film is based on Arenas' posthumously published memoirs. Julian Schnabel directs the film, keeping it accurate to the memoirs while at the same time adding his own personal touch. The film sometimes appears gimmicky (such as when Arenas describes the four "types" of gay men), but mostly the gimmicks add humor and don't remove the viewer from the story. Schnabel, coming from a painter's background, also looks at each frame and sequence as a cinematic painting. And indeed, the film is alive and vibrant, with some shockingly powerful and beautiful images. For example, for those who have seen the trailer but not the film, the sequence where Arenas is on some rocks by the beach, and it begins to rain as he screams. Shots of such beauty are not uncommon in the film, but they are juxtaposed with images of intense cruelty and suffering, which make the audience appreciate them more. Javier Bardem portrays Reinaldo Arenas in a career-making performance. The Academy® knew what they were doing when they nominated Bardem for best actor (although obviously didn't know what they were doing by actually giving it to Russell Crowe). Bardem portrays all the aspects of Arenas' life unflinchingly: the homosexual, the creative writer, and the (literally) tortured artist. To put it bluntly, Bardem made me laugh, cry, and see what it truly means to compromise your ideals and beliefs. If the rest of the movie were trash, Bardem's performance would be reason enough to see this film. However, it is not perfect; Schnabel takes less care with the supporting characters. After Arenas' childhood, where it's fairly easy to understand who is who, Schnabel introduces many characters without warning or explanation. One of Arenas' closest companions in appears through a very confusing sequence. We never truly know who he is, but he plays a vital role in the film and cannot be ignored. Other characters enter the story, and the choice of who gets formally introduced and who is not has no rhyme or reason, as far as I can tell. The most confusing aspect is that Johnny Depp plays two separate characters: the first is a drag queen in jail; the second is as a Lieutenant who interrogates Arenas. We're not sure if this second character is the first one out of drag, or if Depp is playing someone else entirely. In the end, it is Depp playing someone else entirely, but I don't know why Schnabel would cast the same actor in both roles. Arenas was a renowned poet, and his words create scenes that are as literate as they are beautiful. The film makes liberal use of his poetry, as well as the music of Laurie Anderson and Lou Reed, with Carter Burwell composing most of the music. He chose lush, sweeping music than fades in and out, like the tides of the sea; played on synthesizers, the score doesn't sound like an orchestra playing; ironically, the synthesizers sound more organic than a large orchestra would and go a long way towards making the film transcendent, as it were. Laurie Anderson and Lou Reed's contributions cannot be discerned from Burwell's, and one has to wonder if Schnabel really needed the additional music they provide, or if he simply wanted their names associated with the film. Despite the faults, I'm glad I saw Before Night Falls again. And if you don't believe me when I say it's transcendent, I say watch it again. Image Transfer Review: Before Night Falls has several different looks about it, per the director's intent. Some scenes appear very grainy, while others look pristine. Apparently the former were shot on a different film stock than the others, so it should have been easy to differentiate between the two for this transfer. However, several scenes in which I did not remember seeing grain theatrically now appear to have grain on this DVD. Perhaps my memory is failing, but listening to the commentary told me why the grainier stock was used at certain points, and some of the grainy scenes on the transfer do not apply. My conclusion must be that this is simply a grainy transfer. Also, there are several instances of dirt on the print; this surprised me, as the film is from 2000, and I would think they'd be able to find a clean print. Overall, I was disappointed. Audio Transfer Review: There are two 5.1 mixes on Before Night Falls, one in English and one in Spanish. These mixes seem to lack direction. I didn't hear much in the way of differentiation between speakers. It almost seemed like it was a mono track spread between five speakers. I could hear dialogue as clearly in the rear speakers as in the front speakers. Not a stellar mix, but if you're sitting in the middle of the sound field it doesn't sound bad. The disc also comes with a DD2.0 track. Extras Review: The main draw of this disc to would-be buyers is obviously the commentary. I know that when I first looked at the special features, it was what excited me most. Unfortunately, the commentary on Before Night Falls is one of the worst I've yet heard. The format is my least favorite for a commentary: several different people recorded at different times and edited together onto one track. The commentary by the individual people is already dry, and the format of the commentary only makes it worse. Plus, this is one of those films that, for me at least, are more like an organic creature than a movie. I don't want to hear people telling me how they made each shot and what they considered doing instead. Woody Allen, David Lynch, and Stanley Kubrick all feel or felt their movies can and should speak for themselves without additional explanation by the director. This is one of those cases where the film should have been allowed to speak for itself. The disc has three featurettes. The first is an excerpt from a film called Improper Conduct, which is about the cruelties of Castro's Cuba. The excerpt is nothing less than an interview with the real life Reinaldo Arenas, and it is illuminating to hear him speak in his own words. The second featurette is a behind-the-scenes short documentary filmed and narrated by the director's daughter, Lola Schnabel. The narration isn't "scene specific," so we end up seeing several potentially interesting behind-the-scenes footage while hearing Lola ramble about how the camera became part of her. An interesting yet frustrating featurette. The third is a look at Julian Schnabel's paintings. Schnabel began his career as a painter, and in the commentary many people say the film looks like a "Schnabel painting." This featurette allows us to judge for ourselves, and as such is quite interesting. It also previews a nice cross-section of his work. We also have a letterboxed theatrical trailer, and cast and crew filmographies. A powerful and ultimately cathartic movie, Before Night Falls sports beautiful cinematography, mood-enhancing music and a milestone performance by Javier Bardem.